A story filled with castles, pirates, Venetian invaders and volcanoes. Could all that be on a Greek Islands? The answer is yes! All set on the beautiful hill of Kefalos in Paros, which still stands today. Found in the east of Marpissa, north of Piso Livadi, it is the symbol of the region. It is the remains of a dormant volcano, which was built as a Venetian Castle for Lord Somarippa. However the castle fell into the hands of legendary pirate Barbarossa in 1537. He destroyed it and went to Naoussa’s Old Harbour to set up his base of operations there. Today though, you can still visit the hill, where you’ll find the Monastery of St Anthony, open during the morning in the summer months only. Even if you find yourself there later in the day when it’s closed, there is a magnificent view of the path and surrounding area. 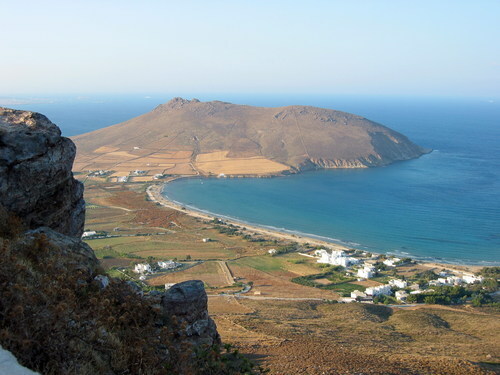 Visitors can enjoy panoramic views of surrounding islands like Naxos, Folegandros, Kimolos and the Aegean Sea. The hill also has rich flora and a variety of aromatic plants that create a unique cocktail of beautiful scents, which many locals include in recipes. The combination of history, the flavors and the views create a perfect environment for hiking. The summer months are a particular favorite, with tourists gathering to climb the hill on foot. It is an absolutely unique experience and an unmissable day if you’re visiting Paros Island.